Our tour began at 9 a.m.
Birdie and I sat on the back seat and had great views. A family of 4 rode with us. We began with the Scenic Rim tour. 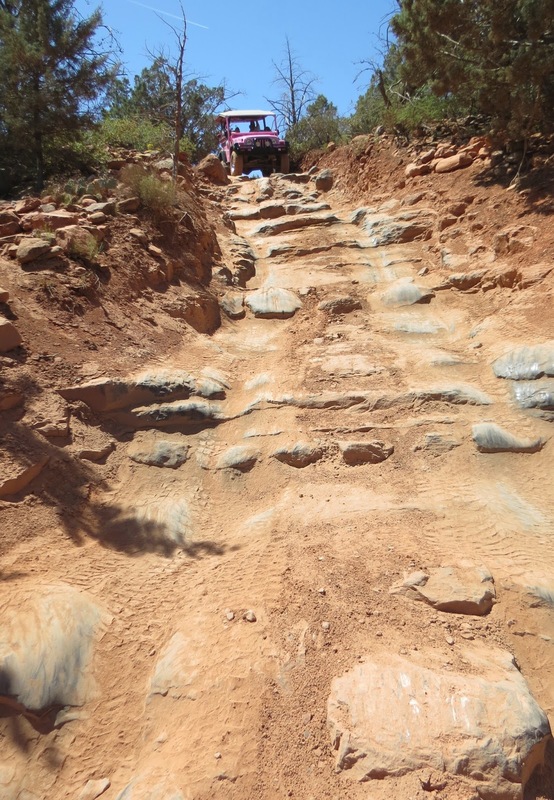 The jeep travels up in elevation towards the Mogollon Rim as it follows the path of an historic wagon road. We pass many trails/mountain bike paths along the way. The road is pretty rough, but fine for a jeep. Double arches in this formation. Can you find the bikers? This formation is called Batman Wings. The red color is from iron oxide. This is called Merry-Go-Round Rock. Behind it you can see the old trail ascending to the top of the Rim. This was our turn around point. Motorcycles do this road too. The formations at the base are called "cow pies." There is a trail to them. The white cliffs are limestone. The kids were worn out already, or bored. They perked up when we started the Broken Arrow, off-road 4X4 experience. The driver was very careful, and the ride was fun, not scary. The only wildlife we saw. Back by the Batman Wings. We stopped at a trailhead to use the restroom before starting the second part of our tour. Bikers getting ready to hit the trail. Looks like Snoopy lying on top of his doghouse. The larger formation has Peanuts' character Lucy in profile. 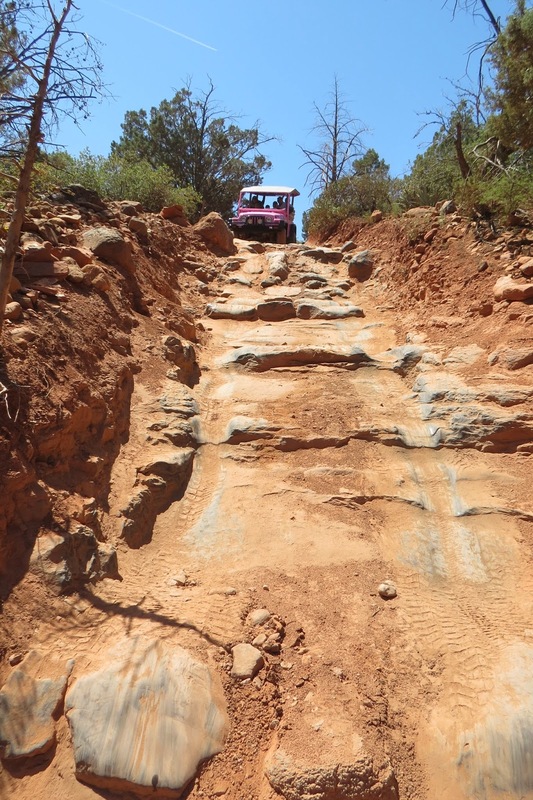 Pink Jeep Tours helps maintain this road. Off road over the red rocks. Bikers like this area too. The lighter colored rock is the path the jeeps take. When meeting another jeep we must back up until we can pull off. Private jeeps or rental jeeps use this road too. Approaching "Chicken Point" where we can get out and walk on the rocks. And there is a fantastic view. The little rock on the left is called Chicken Rock because they used to say if you were afraid to go beyond it, you were chicken. Now it is used as a photo op. I believe these are the rocks he said were the backs of the Two Nuns that overlook the Chapel in the Rock on the other side. We never did get out to see the Chapel. Walking out to Chicken Rock. Birdie getting a picture of the view. Our turn for a photo at Chicken Rock. The rock beyond Chicken Rock that make you a chicken if you don't go that far, haha. Sunbathers on the warm rock. A hiking trail goes below. Mom got a cute picture of the kids hanging onto the jeep. I think my next tow car needs to be a jeep. On to more 4X4 fun! We drive in a circle around it. A view of Submarine Rock that we saw from the helicopter. Hiking trails lead to it. Looking back at Mushroom Rock. Another view of Submarine Rock. Following the gray trail to the top of a rock. The flat area to the left of the bikers is the top. Great view. I didn't realize we were going straight down off the rock from there, oh my! We seemed to pause here for extended photo op. Another Jeep arrives below and tells the driver that what we were about to do was no longer part of the tour...not supposed to do it, lol. Sort of like stopping on a roller coaster, part way down. That was fun. Let's watch the next jeep do it. Another jeep descends the rock. Down a steep rocky incline. Looking back you can get a better perspective. Hope he has good brakes! A close up of hikers on Submarine Rock. That was a lot of fun. Next time I'm in Sedona, I'll do it again on a different tour. On the way back to the campground we stopped at a Forest Visitor Center for a trail map. In the parking area we saw a pair of Summer Tanagers. The male is red. Next up: Call of the Canyon, a wonderful hike near our campground. So glad you took that tour - exciting isn't it. And beautiful. 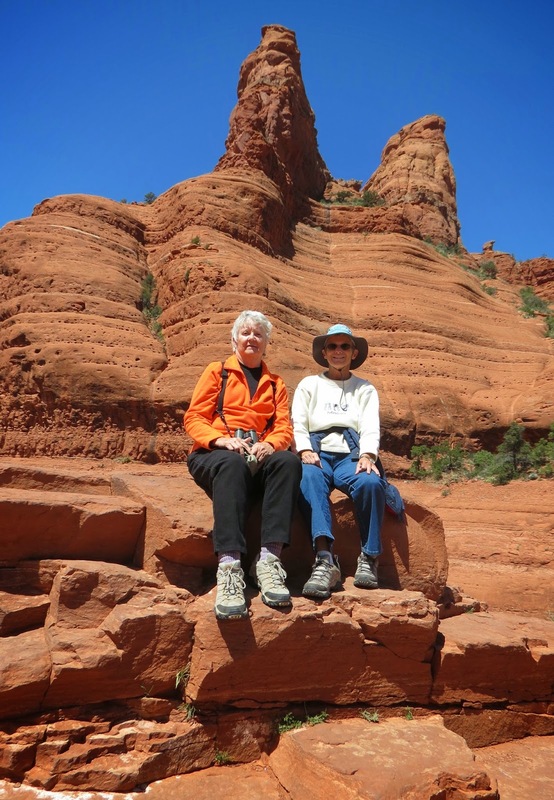 Sedona is one of our favorite places to visit. Willie is jealous he wants to do it again! I think I see what Ava can do with her retirement! Great tour, you got some wonderful pictures for memories. You definitely got the best seat facing forward too.